Santa Rita, New Mexico, U.S.
Harrison Hagan "Jack" Schmitt (born July 3, 1935) is an American geologist, retired NASA astronaut, university professor, former U.S. senator from New Mexico, and, as a crew member of Apollo 17, the most recent living person to have walked on the Moon. In December 1972, as one of the crew on board Apollo 17, Schmitt became the first member of NASA's first scientist-astronaut group to fly in space. As Apollo 17 was the last of the Apollo missions, he also became the twelfth and second-youngest person to set foot on the Moon, and the second-to-last person to step off of the Moon (he boarded the Lunar Module shortly before commander Eugene Cernan). Schmitt also remains the first and only professional scientist to have flown beyond low Earth orbit and to have visited the Moon. He was influential within the community of geologists supporting the Apollo program and, before starting his own preparations for an Apollo mission, had been one of the scientists training those Apollo astronauts chosen to visit the lunar surface. Schmitt resigned from NASA in August 1975 in order to run for election to the United States Senate as a member from New Mexico. As the Republican candidate in the 1976 election, he defeated the two-term Democratic incumbent Joseph Montoya. In 1982, Schmitt was defeated by Democrat Jeff Bingaman. Born July 3, 1935, in Santa Rita, New Mexico, Schmitt grew up in nearby Silver City, and is a graduate of the Western High School (class of 1953). He received a B.S. degree in geology from the California Institute of Technology in 1957 and then spent a year studying geology at the University of Oslo in Norway. He received a Ph.D. in geology from Harvard University in 1964, based on his geological field studies in Norway. Before joining NASA as a member of the first group of scientist-astronauts in June 1965, he worked at the U.S. Geological Survey's Astrogeology Center at Flagstaff, Arizona, developing geological field techniques that would be used by the Apollo crews. Following his selection, Schmitt spent his first year at Air Force UPT learning to become a jet pilot. Upon his return to the astronaut corps in Houston, he played a key role in training Apollo crews to be geologic observers when they were in lunar orbit and competent geologic field workers when they were on the lunar surface. After each of the landing missions, he participated in the examination and evaluation of the returned lunar samples and helped the crews with the scientific aspects of their mission reports. Schmitt spent considerable time becoming proficient in the CSM and LM systems. In March 1970 he became the first of the scientist-astronauts to be assigned to space flight, joining Richard F. Gordon, Jr. (Commander) and Vance Brand (Command Module Pilot) on the Apollo 15 backup crew. The flight rotation put these three in line to fly as prime crew on the third following mission, Apollo 18. When Apollo 18 and Apollo 19 were cancelled in September 1970, the community of lunar geologists supporting Apollo felt so strongly about the need to land a professional geologist on the Moon, that they pressured NASA to reassign Schmitt to a remaining flight. As a result, Schmitt was assigned in August 1971 to fly on the last mission, Apollo 17, replacing Joe Engle as Lunar Module Pilot. Schmitt landed on the Moon with commander Gene Cernan in December 1972. Schmitt claims to have taken the photograph of the Earth known as The Blue Marble, possibly one of the most widely distributed photographic images in existence. NASA officially credits the image to the entire Apollo 17 crew. While on the Moon's surface, Schmitt — the only geologist in the astronaut corps — collected the rock sample designated Troctolite 76535, which has been called "without doubt the most interesting sample returned from the Moon". Among other distinctions, it is the central piece of evidence suggesting that the Moon once possessed an active magnetic field. As he returned to the Lunar Module before Cernan, Schmitt is the next-to-last person to have walked on the Moon's surface. After the completion of Apollo 17, Schmitt played an active role in documenting the Apollo geologic results and also took on the task of organizing NASA's Energy Program Office. Schmitt poses by the American flag, with Earth in the background, during Apollo 17's first EVA. Schmitt collects lunar specimens during the Apollo 17 mission. Schmitt falls while on a Moonwalk. On August 30, 1975, Schmitt resigned from NASA to seek election as a Republican to the United States Senate representing New Mexico in the 1976 election. Schmitt campaigned for fourteen months, and his campaign focused on the future. In the Republican primary, held on June 1, 1976, Schmitt defeated Eugene Peirce. In the election, Schmitt opposed two-term Democratic incumbent Joseph Montoya. He defeated Montoya 57% to 42%. He served one term and, notably, was the ranking Republican member of the Science, Technology, and Space Subcommittee. He sought a second term in 1982, facing state Attorney General Jeff Bingaman. Bingaman attacked Schmitt for not paying enough attention to local matters; his campaign slogan asked, "What on Earth has he done for you lately?" This, combined with the deep recession, proved too much for Schmitt to overcome; he was defeated, 54% to 46%. Following his Senate term, Schmitt has been a consultant in business, geology, space, and public policy. Schmitt is an adjunct professor of engineering physics at the University of Wisconsin–Madison, and has long been a proponent of lunar resource utilization. In 1997 he proposed the Interlune InterMars Initiative, listing among its goals the advancement of private-sector acquisition and use of lunar resources, particularly lunar helium-3 as a fuel for notional nuclear fusion reactors. 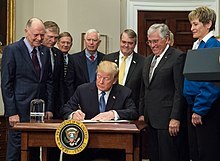 Schmitt was chair of the NASA Advisory Council, whose mandate is to provide technical advice to the NASA Administrator, from November 2005 until his abrupt resignation on October 16, 2008. In November 2008, he quit the Planetary Society over policy advocacy differences, citing the organization's statements on "focusing on Mars as the driving goal of human spaceflight" (Schmitt said that going back to the Moon would speed progress toward a manned Mars mission), on "accelerating research into global climate change through more comprehensive Earth observations" (Schmitt voiced objections to the notion of a present "scientific consensus" on climate change as any policy guide), and on international cooperation (which he felt would retard rather than accelerate progress), among other points of divergence. In January 2011, he was appointed as secretary of the New Mexico Energy, Minerals and Natural Resources Department in the cabinet of Governor Susana Martinez, but was forced to give up the appointment the following month after refusing to submit to a required background investigation. El Paso Times called him the "most celebrated" candidate for New Mexico energy secretary. Schmitt wrote a book entitled Return to the Moon: Exploration, Enterprise, and Energy in the Human Settlement of Space in 2006. He lives in Silver City, New Mexico, and spends some of his summer at his northern Minnesota lake cabin. Schmitt is also involved in several civic projects, including the improvement of the Senator Harrison H. Schmitt Big Sky Hang Glider Park in Albuquerque, New Mexico. Schmitt's view on climate change diverges from the frequently reported scientific consensus, as he emphasizes natural over human factors as driving climate. Schmitt has expressed the view that the risks posed by climate change are overrated, and suggests instead that climate change is a tool for people who are trying to increase the size of government. He resigned his membership in the Planetary Society primarily because of its Mars-first policy, but also because of its stance on global warming, writing in his resignation letter that the "'global warming scare' is being used as a political tool to increase government control over American lives, incomes and decision making. It has no place in the Society's activities. [sic]" Schmitt spoke at the March 2009 International Conference on Climate Change sponsored by the Heartland Institute. He appeared in December that year on the Fox Business Network, saying "[t]he CO2 scare is a red herring". In a 2009 interview with conspiracy theorist and talk-radio host Alex Jones, Schmitt asserted a link between Soviet Communism and the American environmental movement: "I think the whole trend really began with the fall of the Soviet Union. Because the great champion of the opponents of liberty, namely communism, had to find some other place to go and they basically went into the environmental movement." At the Heartland Institute's sixth International Conference on Climate Change Schmitt said that climate change was a stalking horse for National Socialism. Schmitt co-authored a May 8, 2013 Wall Street Journal opinion column with William Happer, contending that increasing levels of carbon dioxide in the atmosphere are not significantly correlated with global warming, attributing the "single-minded demonization of this natural and essential atmospheric gas" to advocates of government control of energy production. Noting a positive relationship between crop resistance to drought and increasing carbon dioxide levels, the authors argued, "Contrary to what some would have us believe, increased carbon dioxide in the atmosphere will benefit the increasing population on the planet by increasing agricultural productivity." Schmitt was portrayed by Tom Amandes in the 1998 miniseries From the Earth to the Moon. Schmitt appeared in the 2007 BBC Two documentary Moon for Sale. Schmitt was interviewed on Infowars, the Alex Jones radio show, on July 31, 2009, regarding his opposition to the mainstream scientific assessment of global warming. He admitted being a fan of the show, saying he "keeps up on things out here". He appeared in an episode of the television show Bill Nye the Science Guy. He was interviewed in the 2009 BBC television show James May on the Moon. He was interviewed by Maltese television talk show Xarabank, the episode airing December 11, 2009, 2045 CET. Schmitt (R) receives the 2015 Leif Erikson Exploration Award from Ólafur Ragnar Grímsson (L), President of Iceland. He was made an honorary fellow of the Geological Society of America for his efforts in geoscience in 1984. One of the elementary schools in Schmitt's hometown of Silver City, New Mexico was named in his honor in the mid-1970s. An image of the astronaut riding a rocket through space is displayed on the front of Harrison Schmitt Elementary School. AAPG's Special Award has been changed to the Harrison Schmitt Award in 2011. It recognizes individuals or organizations that, for a variety of reasons, do not qualify for other Association honors or awards. Schmitt received the award in 1973 for his contribution as the first geologist to land on the Moon and study its geology. 2015 Recipient of the Leif Erikson Exploration Award, awarded by The Exploration Museum, for his scientific work on the surface of the Moon in 1972, and for his part in the geology training of all the astronauts that walked on the Moon before him. Schmitt was inducted into the International Space Hall of Fame in 1977. He was one of 24 Apollo astronauts who were inducted into the U.S. Astronaut Hall of Fame in 1997. Schmitt is one of the astronauts featured in the 2007 documentary In the Shadow of the Moon. He also contributed to the book NASA's Scientist-Astronauts by David Shayler and Colin Burgess. ^ "Apollo 17". NASA. Retrieved June 29, 2016. ^ "Extravehicular Activity". NASA history. Retrieved June 29, 2016. ^ "Naked Science: Living on the Moon". National Geographic Television. August 15, 2010. ^ "Schmitt One Of Those Who Has Been There". Alamogordo Daily News. Alamogordo, New Mexico. October 16, 1977. p. 10 – via Newspapers.com. 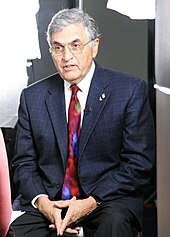 ^ a b c "50 Years in Space - Harrison Schmitt". California Institute of Technology. Archived from the original on June 15, 2009. Retrieved June 16, 2009. ^ "Distinguished Alumni Awards" (PDF). California Institute of Technology. Retrieved April 24, 2019. ^ "Learned to walk on the moon in Oslo". Universitas. May 27, 2009. Archived from the original on June 15, 2009. Retrieved June 15, 2009. ^ Schmitt, Harrison Hagan (1964). Petrology and structure of the Eiksundsdal Eclogite Complex, Hareidland, Sunnmøre, Norway (Ph.D.). Harvard University. OCLC 76977172 – via ProQuest. ^ "Six Young Scientists Become US Astronauts Today at Space Center". Lebanon Daily News. Lebanon, Pennsylvania. UPI. June 29, 1965. p. 17 – via Newspapers.com. ^ "Vermont Scientist May Be On Early Mission to the Moon". The Burlington Free Press. Burlington, Vermont. Associated Press. June 28, 1965. p. 1 – via Newspapers.com. ^ "A Running Start – Apollo 17 up to Powered Descent Initiation". Apollo Lunar Surface Journal. Archived from the original on March 20, 2012. Retrieved August 25, 2011. ^ Reinert, Al (April 12, 2011). "The Blue Marble Shot: Our First Complete Photograph of Earth". The Atlantic. ^ Nancy S. Todd. "Lunar Sample Compendium". ^ "Rock Suggests Early Moon's Fiery Core Churned a Magnetic Field". The New York Times. January 20, 2009. ^ Graves, Howard (September 10, 1975). "Schmitt Announces He's Seeking U.S. Senate". Silver City Daily Press. Silver City, New Mexico. Associated Press. p. 1 – via Newspapers.com. ^ Chriss, Nicholas (September 18, 1975). "Astronaut Corps Getting Thinner and Thinner". Florida Today. Cocoa, Florida. p. 11A. ^ a b Feather, Bill (November 3, 1976). "Montoya's Tenure Ended by Schmitt". Las Vegas Optic. Las Vegas, New Mexico. Associated Press. p. 1 – via Newspapers.com. ^ "Montoya, Schmitt, Peirce on Ballots". Las Cruces Sun-News. UPI. March 28, 1976. p. 1 – via Newspapers.com. ^ "Schmitt Landslide Ends Montoya Senate Reign". Clovis News-Journal. Clovis, New Mexico. Associated Press. November 3, 1976. p. 1 – via Newspapers.com. ^ "The Astronauts Who Went to the Moon - The 40th Anniversary of the Moon Landing - TIME". TIME.com. July 16, 2009. Retrieved June 5, 2018. ^ "Harrison J. Schmitt". engr.wisc.edu. University of Wisconsin—. Archived from the original on February 2, 2007. Retrieved November 20, 2017. ^ Kulcinski, G. L.; Schmitt, Harrison H. (September 1, 1988). The moon: an abundant source of clean and safe fusion fuel for the 21st century. Lunar Helium-3 and Fusion Power. pp. 35–64. Bibcode:1988lhfp.rept...35K. ^ Schmitt, Harrison H. (1997). "Interlune-Intermars Business Initiative: Returning to Deep Space". Journal of Aerospace Engineering. 10 (2): 60–67. doi:10.1061/(ASCE)0893-1321(1997)10:2(60). ^ "NASA - Schmitt Completes NASA Advisory Council Service; Ford Named Chairman". nasa.gov. NASA. October 2008. ^ a b c "Former NASA Advisory Council Chair Jack Schmitt Quits Planetary Society Over New Roadmap". SpaceRef.com. November 17, 2008. Retrieved August 4, 2018. ^ "Harrison Schmitt withdraws nomination for New Mexico energy secretary". El Paso Times. February 11, 2011. Archived from the original on September 6, 2012. ^ Simonich, Milan (February 11, 2011). "Harrison Schmitt withdraws nomination for New Mexico energy secretary". El Paso Times. Archived from the original on September 6, 2012. Retrieved October 6, 2014. ^ Schmitt, Harrison H. (2005). Return to the Moon: Exploration, Enterprise, and Energy in the Human Settlement of Space. Springer London, Limited. ISBN 978-0-387-31064-0. Retrieved March 23, 2013. ^ "Is Global Warming Real?". Fox Business. ^ "Moonstruck: Climate science denier Harrison Schmitt, appointed to head NM environment agency, believes enviros and scientists like Holdren are communists - ThinkProgress". ThinkProgress. ^ Klein, Naomi (November 9, 2011). "Capitalism vs. the Climate". The Nation. Retrieved August 23, 2012. ^ Harrison H. Schmitt And William Happer (May 8, 2013). "Harrison H. Schmitt and William Happer: In Defense of Carbon Dioxide". WSJ. ^ "From the Earth to the Moon: Full Cast and Crew". IMDb. Retrieved March 17, 2018. ^ "Bill Nye the Science Guy". TV Guide. Retrieved March 17, 2018. 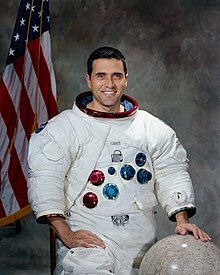 ^ "Harrison Schmitt NASA Biography". NASA. Retrieved February 6, 2018. ^ "Dyar wins 2016 GSA Gilbert Award". NASA. Retrieved March 17, 2018. ^ "Harrison Schmitt Elementary - Home". Archived from the original on July 2, 2014. Retrieved March 28, 2014. ^ "The Leif Erikson Exploration Awards". Retrieved November 30, 2015. ^ "Space Hall Honors Pioneers". Las Cruces Sun-News. Las Cruces, New Mexico. October 30, 1977. p. 6 – via Newspapers.com. ^ "In the Shadow of the Moon: Full Cast and Crew". IMDb. Retrieved March 17, 2018. Wikimedia Commons has media related to Harrison H. Schmitt. This page was last edited on 24 April 2019, at 15:02 (UTC).